SAP® SuccessFactors® says the machines are here, but not to take your jobs. Instead, SuccessFactors expects machines to give people the freedom to find purpose in their work. For many years, human resources professionals have hoped manager self-service could help alleviate the burden of administrative tasks and allow for more purposeful work. SuccessFactors is now turning to machine learning to do that. True manager self-service has often been hindered by manager knowledge of HR processes. At SuccessConnect, SuccessFactors demonstrated how introducing a digital assistant can help managers become more self-reliant for HR tasks such as promoting or transferring an employee. SuccessFactors product lead Amy Wilson demos the new digital assistant. A digital assistant driven by machine learning can provide only the information a manager needs to know for a particular situation—such as what title a promoted employee should have or a suggestion on compensation. That’s without the manager needing to memorize HR guidelines on external titles or raises. By being able to identify with a digital assistant an employee’s new title and compensation, those tasks are taken off the backs of HR employees. It also enables managers on HR processes without forcing them to become HR experts. This technology is not far off for SuccessFactors either. 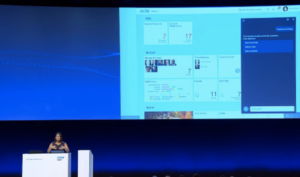 SuccessFactors head of product Amy Wilson noted during her keynote speech at SuccessConnect in Berlin that digital assistants will be rolled out later in 2018, with more complex manager self-service tasks expected to be incorporated within the next year. The best news? The digital assistants will be free—they will be included in future SuccessFactors upgrades. SuccessFactors Workforce Analytics will soon be rolled into SAP Analytics Cloud. Additionally, all current transactional reporting currently embedded inside SuccessFactors modules will be fueled by Analytics Cloud. Those reporting and analytics changes will being going into beta this fall. Current Workforce Analytics customers will be rolled over to Analytics Cloud free of charge when that move happens, and all embedded reporting and analytics improvements will come as part of current SuccessFactors subscriptions. Last year, the major SuccessFactors announcement on the mobile front was a natively built iOS app. This year, it’s time for Android users to get the special treatment. Coming in Q3 will be a native Android SuccessFactors application that incorporates all the same functionality as the iOS app—including all SuccessFactors modules. The key difference will be that the app will be designed to fit Android user patterns—so not all screens will look exactly the same, but they will feel comfortable to the user based on their experiences with other applications. With major developments in machine learning capabilities, analytics, and mobile expected to come by the end of 2018 SuccessFactors has shown it is dedicated to providing more than just updates each quarter. Instead, it plans to innovate using the latest technologies–both SAP and beyond. The key for customers to take advantage of these major upgrades will be effective sustainment and change management strategies to maximize their SuccessFactors investment. Contact /N SPRO to help build your SAP SuccessFactors sustainment and change management programs.